This model of the Presto Electric Pressure Cooker offers lots of features at a very reasonable price. No, it can’t make yogurt, and it has fewer bells and whistles than the leading brand, but plenty of owners say it meets their needs and are quite happy with it. 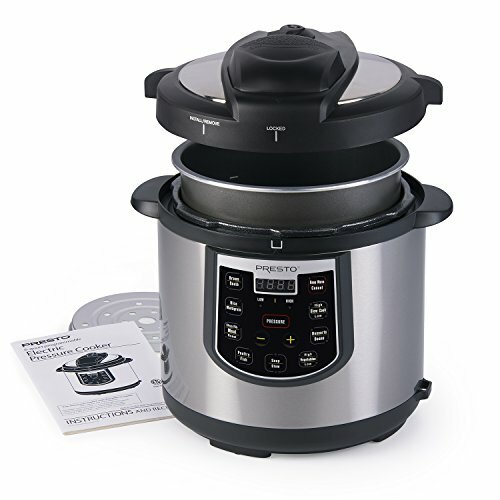 The Presto Electric Pressure Cooker model 2141 has a 6 quart cooking capacity, is fully programmable (manually), and includes 19 pre-sets for cooking a wide range of foods. Functions include cooking with high or low pressure, slow cooking, browning, and sautéing. When a cooking cycle is complete the Presto will automatically switch to its Keep Warm mode. Lots of owners feel that this is a good model at a great price, but is it the right choice for you? Read on to find out! Read our complete Presto Electric Pressure Cooker review below. It’s no secret that the number one best selling electric pressure cooker is the Instant Pot. 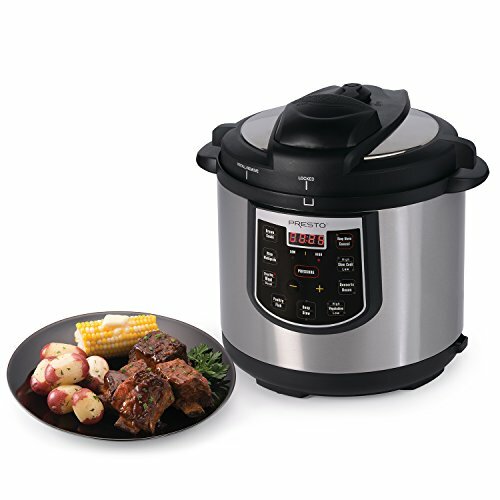 Since everyone is so familiar with that, let’s start with how this model differs from the Instant Pot. The Presto 2141 does not have a delay timer, but you may not miss that. After all, how often would you load up your pressure cooker in the morning and set it to come on right before you get home from work? That wouldn’t be safe for any kind of raw meat and lots of other foods. The manufacturer does not make a stainless steel cooking pot for the Presto, so it’s not an option even if you were willing to pay extra. What you get instead is a metal pan with a nonstick coating. It’s easy to clean and can go in the dishwasher, and some people enjoy the lighter weight as it’s easier to handle. However, if you have concerns about nonstick coatings, this pressure cooker is not a good choice for you. Note that the Presto can be set to cook vegetables for 0 minutes. This means that as soon as pressure is reached, the unit will stop heating so that your veggies don’t end up too soft or completely overcooked. One of the eight built-in safety features of this model is its cover locking system. It is designed to allow pressure to build inside the cooker only when the cover is closed securely. The system also prevents the cover from being opened until after pressure has been reduced to a safe level. Of course, safety is also up to the user. No matter which pressure cooker you buy, be sure to read and follow all of the manufacturer’s instructions and recommendations. The instruction booklet includes about 25 recipes and some timetables to help you get started. It isn’t a complete cookbook, but it can be very useful even if this isn’t your first pressure cooker. The maximum pressure can vary among different brands and models, and that can affect your total cooking time. The best way to adapt recipes for your Presto is to use the information in the instructions as a guide. There are no accessories designed specifically for the Presto 2141 model. Though not really an “accessory”, a nice extra to have is a pair of pinch-mitts. Out of just over 100 online reviews there were a few reports of units that malfunctioned within the first few months of ownership. Presto offers a 1 year warranty and apparently honors it. You’ll find plenty of evidence that the company is monitoring online reviews and responding where needed or helpful. A few customers feel that the quality is not quite up to that of the Instant Pot, but then, the Presto also costs less. Be aware that the inner cooking pot is not stainless steel. It is nonstick metal. Some people actually prefer that because it’s more lightweight, but of course that’s just a personal preference. One person felt that the searing function does not heat to a high enough temperature. At the same time, a few others praised this feature, which makes you wonder if the other person just had a bad unit. Keep in mind that to date there are only about 107 online reviews. Some aspects can be hard to judge when feedback is still so limited, but overall, most comments are extremely positive. The Presto is user friendly so there isn’t a big learning curve involved. It’s very versatile, allows you to cook with high or low pressure, offers a multitude of pre-sets, and will even double as a slow cooker. A huge majority of owners love the results they get, and they most appreciate the ability to go from frozen food to ready-to-serve so quickly. Compared to the leading brand, the Presto Electric Pressure Cooker is a good bargain buy. The downsides are that the quality of the Presto may be slightly lower, and you can’t get a stainless steel cooking pot. If you’re okay with that, then this less expensive model may be all you ever need. You get a 6 quart cooking capacity and all of the most important features used by the average cook. It can be programmed manually and also includes a variety of pre-sets, plus it has an automatic Keep Warm mode. 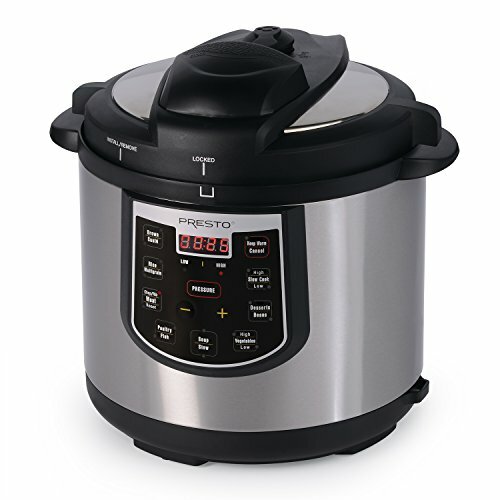 If you’re on a tight budget or just don’t want to invest a lot in a pressure cooker, this model is definitely worth a closer look.